Well, I'm kinda' stretching to get there but there is a connection. 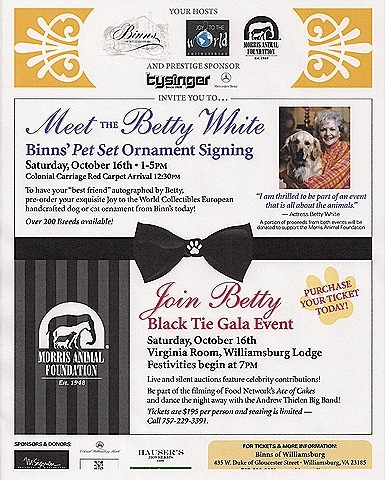 This event is coming up in Williamsburg, just down the road from Hampton where I live. I was asked to contribute a creation for the silent auction. Do you think they meant moi when they referred to celebrity contributions ?? I thought it was only appropriate to make a cute doggie tote. All this to benefit the Morris Animal Foundation so I hope my little contribution goes a long way to help. Of course this will help and as for you being a celebrity…. of course you are. 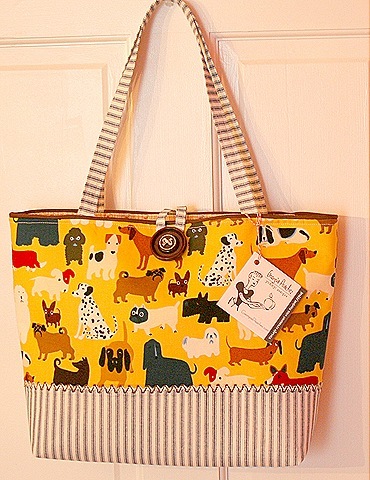 You have blog and you make beautiful doggie totes for charity. That counts as a “celeb” in my book. I just love that bag. Betty White is suddenly all the rage. I keep seeing her face on stuff in stores. That is adorable. Your logo will be on the ad that runs in Sunday’s paper. Be sure to look for it!!!! You are so wonderful to donate your lovely tote. I think we all want to be Betty White when we grow up.